A girl who has the ability to watch the spirits of the death, that has a very important secret in his memory, that unfortunately she lost after escaping from a mental institution. 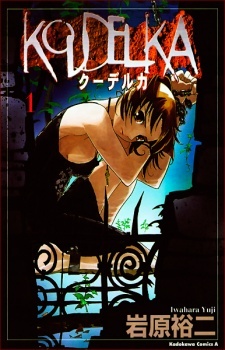 This manga is a sequel of the PSX game of the same name: Koudelka. So, ok. Koudelka is about a girl who escapes from a sanatorium and has some strange powers. She doesn't know anything about her past or her abilities. But then she meets Joshua, a little boy who lives alone in an abandoned church in a small city after his mother passes away. After that meeting, both start to discover things about their past. The very first chapters are placed in the small city where Joshua lives, but after some problems he and Koudelka end up at where he used to live with his mother, in Paris. So, the story is not new, especially what comes after they go to Paris, when you read you go like "oh, I've seen that before, it's going to happen this and that..."; but still it's good; you can't compare with other stories about the same genre, like FMA or Shaman King. I'd say it's a mix of other series [and Moulin Rouge as well], and I liked how it worked out. The only problem is that the manga is only 3 volumes long. So, yeah, for such an intense plot you'll feel that another 1 or 2 volumes are missing. Nothing to complain about. As an artist, I enjoyed the art, although it's a bit too much polluted and sometimes you get confused. But I loved the eyes, and the clothes! If you liked the dresses from Moulin Rouge, you are going to enjoy this manga for sure. Although the women are super cute/beautiful, the men are... I wouldn't say ugly, but very characteristic and plausible. All the characters have their own issues and reasons for doing everything they do in the series. Which is great, because nobody wants to see a character coming out from nowhere. Still, I think in the end they rushed a bit the story, what makes you feel [again] it shouldn't be 3 volumes long. But all the characters are charismatic, especially the courtesans Koudelka and Joshua meet in Paris. I gave a 10 for enjoyment because I really, really liked the story. I could feel what the characters where felling, and cheer for them - something I was not expecting to happen when I first read the synopsis. It's a pretty story, if you like the genre you should check it out. It's a short manga, so you won't feel you wasted your time even if you don't like it. Koudelka is a beautiful story about accepting who you are and how you can change your future with your attitudes. It's also a story about letting go your past, so you can build up your future. I didn't gave it a 10 just because I thought it was too short. But I think that if I felt that, was because it somehow catched my attetion. What in the world did I just now read? !